My mission to learn all things absinthe recently hit another waypoint after a mail from Maya of Distillnation (excellent doers of things with booze). I’d met her a little while back at Rumfest, where she ‘forced’ me to try the Botran range, and wondered if I’d like to learn some more about La Clandestine absinthe and its stablemates, as well as meet Alan Moss of Artemisia, one of the folks behind the liquid. After some date wrangling I ended up sitting with Alan one evening at Montgomery Place, one of the increasing number of bars starting to take Absinthe seriously, for a chat and a taste of his boozes. Alan has been working in the spirits industry for years, spending time in Asia before his more recent return to Europe and his immersion into the world of absinthe. He looks after the marketing and selling side of things (now working in 22 countries) while Claude-Alain Bugnon looks after the distillation back in Couvet, Switzerland, generally considered to be the birthplace of Absinthe. Claude-Alain worked in oil refining but returned home to Couvet and used his petroleum related knowledge to do some illicit distilling, moving into legitimate business when the Swiss absinthe ban was lifted in 2005. Since then he’s become one of the figureheads of traditional absinthe making, along with Jade‘s Ted Breaux. 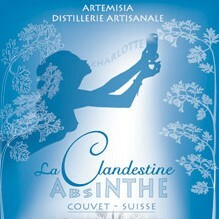 First up in their range is La Clandestine, the absinthe that Claude-Alain became known for in the pre-2005 days and which became his first commercial product. It’s what I’d refer to as a blanche absinthe, as it has no post-distillation colouring step, and is described as a ‘bleue’ absinthe, as is the Swiss style. It isn’t actually blue, the blue bottle just playing on the name, but is a traditional Swiss styled absinthe – as Alan pointed out, you can’t get a verte absinthe without first producing a blanche to swish some herbs around in. The Swiss were making Les Bleues before the ban and continued to do so afterwards, the lack of colour making it easier to conceal amongst other less illegal spirits, abandoning the ‘more modern’ verte style. Clandestine is made to a recipe from the 1930s that Claude-Alain bought and is produced using proper maceration and distillation, like all of the range. I tasted all of the absinthes at about 3-1 dilution water-spirit, although as it was dark in Montgomery Place and I was aiming a fountain from above it was all fairly rough and ready (as it should be). On the nose it was sweet and spicy, with a bit of vegetal wormwood, anis and some peppermint. To taste it was very minty with cream, fennel, a light sugariness and some bitter herbs, with a lingering spicy aniseed ball warmth on the palate. One thing I really noticed was quite how sticky it was – after adding water it still stuck to the sides of the glass as I drank, giving a milky sheen. 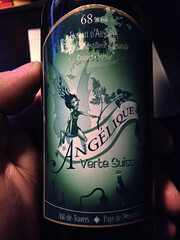 Next we tried Angelique, a verte which Alan describes as their aperitif absinthe. It’s named after Claude-Alain’s daughter Angelica, also giving a nod towards angelic/demonic nature of the pre-ban attitudes to absinthe. 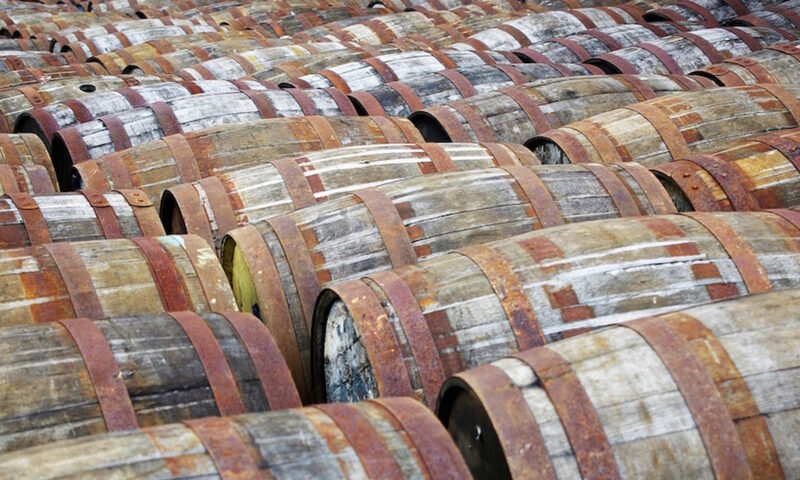 The recipe has changed since it was first introduced in 2007, with one key alteration being the reduction in how much Grande Wormwood is used in the post-distillation maceration. Grande Wormwood is very pungent and mainly used in the initial steeping, allowing the bitter flavours to stay behind in the still during distillation, and its influence is quite noticeable in the Angelique – in order to appeal to a wider range of palates they’ve slowly reduced the amount, settling on today’s balanced bitterness. On the nose it is quite spirity, with noticeable bitter wood, lots of leafy greenness, fennel tops, sweet pastry and maybe a hint of apple. To taste it starts with a big hit of aniseed followed up by a punch of bitter green and woody wormwood. Once that fades mint and aniseed balls linger with a bit of a spicy tingle on the tongue. On its own I was initially sceptical, but Alan gave me a small bottle to take home and I’ve been experimenting with it since. A bit of sugar takes the edge off the bitterness, but I’ve found that I rather like the more bitter edge from time to time. It’s also my favourite absinthe to use in Sazerac cocktails – I recently obtained a copy of the Savoy Cocktail Book and have taken to using Harry Craddock’s method of putting a few drops of absinthe into the cocktail rather than rinsing the glass with it. This works very well with Angelique, with the bitterness happily offsetting the sweetness of the rest of the cocktail and adding some interesting herbal notes that help the sweetshop aroma of the drink come alive. It was an interesting and quite tasty combination, but Angelique didn’t work all that well as the sole balancing ingredient to the champagne, which was rather dry leading to a generally tart and bitter drink. A dash or two of simple syrup, or a sweeter absinthe, would have taken the edge off of the bitterness and dryness and opened up more of the flavours. Next time I’m near an open bottle of champagne and have some absinthe to hand experimentation will be done. 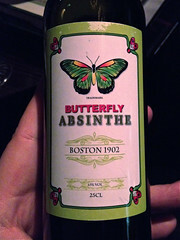 The third absinthe in their range is Butterfly, different to the other two in that it is made to an American recipe. 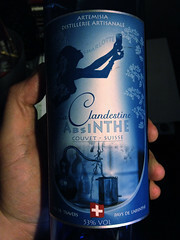 At the turn of the 20th century absinthe was quite popular in the USA, with a good number of distillers producing it across the country, but in 1912 laws were passed banning its importation and interstate transport, leading to an eventual ban in 1916 along with all alcoholic drinks thanks to the Volstead Act and the start of Prohibition. A few bottles of the original Butterfly, a Boston brand from the early 1900s, have been found but they’ve generally been empty, which hasn’t allowed a deconstruction and recreation, as has been done with other absinthes of the era. However a hand written recipe was unearthed by the owner of Absinthe Devil, an absinthe equipment website, and he approached Claude-Alain with the idea of producing absinthe under the Butterfly name again. Unfortunately noone knows if the recipe is the one used to make the original, but it’s from the right era and has some differences to it that mark it out as apart from the European styles, noticeably the inclusion of citrus peel as a botanical. On the nose there was the expected citrus peel, leafy mint, and musky wood with an earthy bitterness. To taste there was pine, butter and spice, a building bitterness which cut off with bitter anis and a hint of soap. A nice balance of sweet and bitter, with an un-traditional (for Europe, at least) citrus edge, that appeals to the stereotypical American palate, which prefers a sweeter drink as opposed to the bitter loving European tongue. 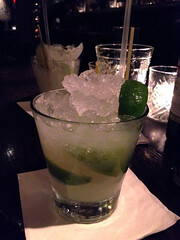 We followed this up with a final cocktail, a speciality of the house showcasing their love of Absinthe – The Clandestino, a Caipirinha with the Cachaça switched out for absinthe: Muddle lime wedges and granulated sugar, add crushed ice and top up with absinthe. I was slightly wary but very surprised at how very well it worked. The citrus edge of the Butterfly should have warned me that it would come together, but it was sour and sweet, and had a nice aniseed punch running through it, along with some vegetal flavours. All three absinthes in the Artemesia range are quite readily available and you’ll find them in pretty much every bar that has real absinthe (Alan is a busy man) as well as at most decent specialist spirits retailers. At the moment they do 70cl bottles in the UK, as weights and measures regs stop them from distributing the smaller 25cl bottles they produce for other markets over here, but hopefully they’ll get that sorted out soon so that people can do some more comparing and contrasting of their absinthes. Many thanks to Alan and Francis from Distillnation for organising the evening and telling me tales of the drinks industry, as well as the takeaway bottle of Angelique and sample of Clandestine for further ‘work’ at home.